Two days from now, India plays Bangladesh in the quarter finals of ICC World Cup 2015. India which tops the group by winning all matches in the league are the favorites. Experts believe it, fans are obviously already chanting “India! India!”, even Microsoft’s Bing has predicted a win percentage of 30%. After correctly predicting 15 out of the 16 FIFA World Cup knockout stage games, Bing- the search engine from Microsoft is using its ability to leverage the power of web outcomes of the 2015 ICC World Cup. During the FIFA World Cup predictions Bing had shared on its blog that in the process of predicting outcomes of sporting events, the model evaluates the strength of each team through a variety of factors such as previous win/loss/tie record in qualification matches and other international competitions and margin of victory in these contests. For the ongoing ICC WorldCup 2015, if you are keen to check the predictions made by Bing before you draw your chips then you can just type in Cricket in the search box and voila! This is what you get to see after you hit the search button. The above screen shot shows you a timeline, just click on the dates and get all the required content for that day’s cricket game. Click on Friday 20th March and you can see the prediction results of the game with Bing predicting that India is the winner. Along with the team stats and related news Bing has small engaging pieces such as polls, quiz and trivia running on the page. Additionally search for any cricket team or player and you’ll see a “snapshot” of all the relevant stats. Searching for your home team? The entire squad is displayed at the top of the page. Search for “cricket WC winning captains” to find a list of captains whose teams have lifted the World Cup in the past. To take #BingPredicts to the netizens, Microsoft has been running a simple yet creative visual campaign. Humans think either from their heart or their brain; taking inspiration from this behaviour Microsoft India has been creating these lovely creatives to promote the prediction results. For the forthcoming encounter the #DilSay (From the heart) predicts that India is on a winning streak but the #DimagSay (From the brain) reminds of the 2007 world cup when India lost to Bangladesh. These prediction visuals are being shared both on Facebook and Twitter with a link that drives the user to the prediction page on Bing. Besides Microsoft has been building quirky visual content around trivia, polls, live updates while driving users to Bing. Celebrations with fans are also a ritual with India wining match after match and #BingPredicts scoring points with every win. But then just as Nostradamus’ predictions have failed, so has been the case with Bing. 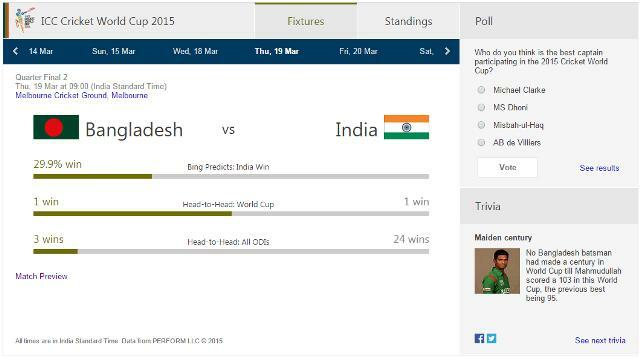 During the South Africa- India league match Bing had predicted that India will be defeated for the fourth time. Thanks to the Indian team they broke the jinx and served a thrashing defeat to the Proteas. One of the data Bing considers in its model is the past sporting occurrences and that favored South Africa since it has beaten India thrice in a World Cup game. Digital integration and building engagement with creative visuals is the scoring point for Microsoft India on social media. Besides the subtle touch of the local flavour in the communications and visuals also adds up to the fan excitement. Association with cricketing experts on Twitter has given the required eyeballs to the campaign on the platform. Its a relief to see that Microsoft India is investing in content rather than just pushing money on Twitter contests – a common campaign idea to be driven on the platform during such events. Without a doubt, Indian fans would want Bing to be right this time, so that India sails smoothly to the semis keeping its winning spree on.